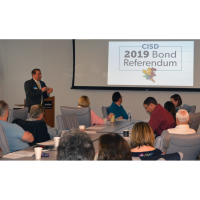 The Woodlands, Texas – The Woodlands Area Chamber of Commerce’s Business Advocacy Council received an update on Conroe Independent School District’s $807 million bond referendum election set for May 4 at a council meeting on Friday, February 15 at The Chamber office. In a presentation to the council, Superintendent Curtis Null explained the bond proposal addresses CISD’s growing student population and districtwide needs. According to data from a 2018 Population and Survey Analysts demographics study, CISD has grown by more than 15,000 students over the past decade, and it is estimated the district would reach 76,000 students by 2028.